As iPad Pro units are now shipping, people are discovering the USB 3 hardware and testing copy speeds between the iPad Pro and computers. I learned a little tidbit from a source today: the Lightning port on the upcoming iPad Pro will transfer data at USB 3 speeds, faster than current iPads. That’s potentially good news for photographers and videographers who import images and video clips from SD cards or cameras directly to the iPad for editing and reviewing. I don’t know offhand if the existing Lightning camera adapters will also support that speed or if new adapters will be required. But it’s a welcome change for those of us who have spent many many minutes waiting for media to transfer before we can act on it. I can’t wait to learn more details as we get closer to the November release date. 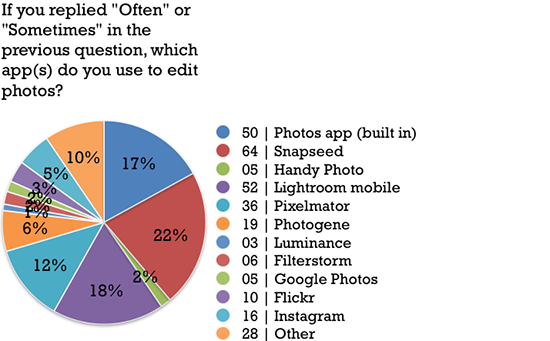 Related: I’m running a survey to see how photographers are using the iPad in their workflows. It takes just a couple of minutes, and you could win a bundle of three of my latest books. Click here to take the survey. 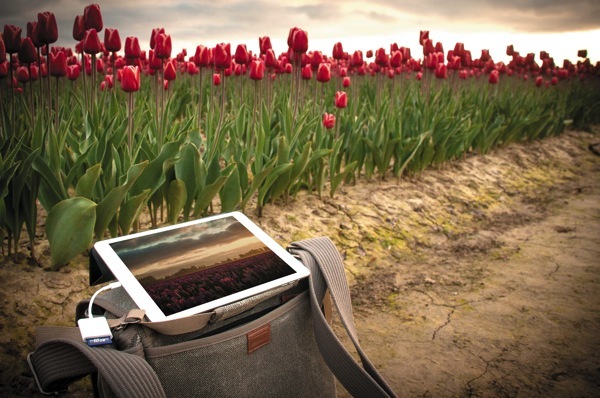 The iPad for Photographers survey results are here. In 2011, I saw the potential of the iPad as a photographer’s tool and wrote the first edition of The iPad for Photographers, which detailed how you could review photos you capture using other cameras (at the time, the iPad 2 had only just come out, the first model to include an admittedly terrible camera), apply metadata to them to streamline the tagging process, and of course edit and share them—all without using a desktop or laptop computer. I published, in cooperation with my friends at Peachpit Press, two subsequent editions of the book. Most people who import photos to the iPad do so using the wired Camera Connection Kit (older iPads) or Lightning SD Card or USB adapters. 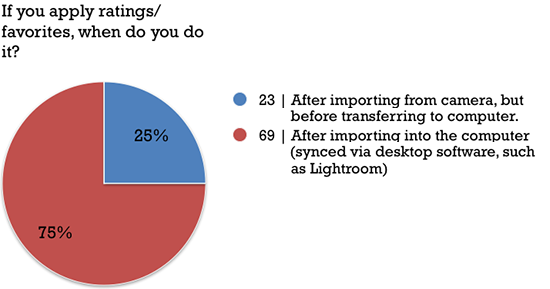 Almost as many sync via iCloud, Lightroom mobile, Google Photos, or some other cloud service. The number of folks transferring photos directly from a camera’s built-in Wi-Fi feature was about half of those others, but considering how long it’s taken companies to implement Wi-Fi into cameras, the number is larger than I expected. People rarely assign ratings or favorites to elevate the good photos from the not-so-good. I suspect this is because the process of importing photos onto the iPad is still time-consuming. Most people don’t bother with any additional metadata. The fact that the apps designed for doing so (such as Photosmith and PhotosInfoPro) have all gone dormant bears this out. More effort seems to be going into editing photos, and of the tools available, Snapseed is the leader, followed by Lightroom mobile and Apple’s built-in Photos app. Surprisingly, the iPad Air 2 was the most-used model—the latest model available at the time the survey was posted. I expected that there would be a broader spread of older models. Of those, a little more than half were Wi-Fi–only models. The 64 GB configuration is the sweet spot in terms of storage. A quick but important caveat: The survey attracted just 132 responses, which is less than I hoped, but it at least provides a window into the preferences of those who chose to take the survey. The iPad is strong on editing, but the effort needed to get to that point is greater than it should be. That means using an iPad as a field companion—appealing especially for people who don’t want to tote a laptop along—is possible, but it’s hampered by slow ingest and limited storage. Perhaps the iPad Pro, which will offer USB 3 speeds through its Lightning port, may improve this. I’m not too surprised that the Cloud has turned into a preferred method of moving photos onto the iPad, although of course the usefulness depends entirely on your current Internet connection—likely fine when you’re at home on the couch, but not so great in remote locations. And, lastly, no one is using the iPad to apply metadata. This is the top request I hear from professional photographers, but I don’t think most regular people are doing it. Perhaps services like Google Photos, which comes up with its own metadata based on automated visual searches of photos, is the future here. I still believe that metadata is a powerful thing for photos, regardless of your photo skill level or interest; in my book Take Control of Your Digital Photos on a Mac, Second Edition, I present a painless way to do it on the Mac. The big question as I write this is how, or if, the iPad Pro will affect the field. Apple still hasn’t implemented any type of raw format support into iOS, which reduces the Pro’s appeal for many photographers in terms of editing, although perhaps the iPad Pro will be fast and powerful enough to run an app such as PiRAWhna smoothly. We’ll have to see. The survey results appear below. Thank you to everyone who took the time to take the survey and share their comments! Today is release day for iOS 9 (10 a.m. PST), which means (1) Apple’s servers will probably be slammed all day and it could take a long time to download and install the update, and (2) not all third-party apps are ready for the new operating system. Before you apply the free upgrade, make sure any apps you rely on work properly. So far I’ve seen updates to ShutterSnitch, The Photographer’s Ephemeris, Handy Photo, and Flickr, to name a few photo-related apps. Others may already work fine with iOS 9 without a special update. And at least two are specifically not ready yet: CamRanger and Fujifilm Cam Remote. iOS 9 is released tomorrow, please hold off on updating your iPhone/iPad as some CamRanger features will not work. Check back in a week. I’ve been running iOS 9 betas for several weeks with few issues, but it’s always good to be cautious right when major new operating systems are sent to the wider world. Be sure to make an encrypted backup via iTunes before you update; that retains a lot of passwords and other information that you’d otherwise have to provide during the update process. If you subscribe to Adobe’s Creative Cloud Photography Plan (which includes Lightroom CC and Photoshop CC, plus Creative Cloud syncing and Lightroom mobile for $10 a month), you probably received an email today containing a familiar name: me! 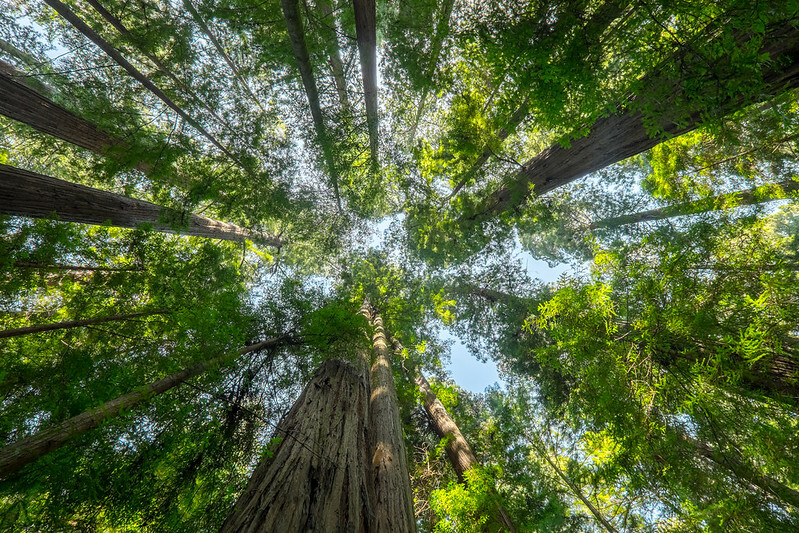 One of the highlights is a pointer (shown above) to the article that I published in Adobe Inspire in June, “Take Lightroom on Your Next Shoot.” If you missed the article when I pointed to it then, it’s all about how I used Lightroom mobile during a photo workshop in May through the California Redwoods. I love writing articles like this, which point to practical things you can do with your photos in addition to inspiring you to get out and make more images. It was a fun one to write. Over at PetaPixel, National Geographic Traveler photographer Susan Seubert explains how she prepares for international photo travel. Research is key, as is using apps such as Easy Release and Sun Seeker on her iPad while in the field. Read the whole thing, which covers valuable information on researching destinations and packing photography gear. One of the questions I’ve fielded often since the first edition of The iPad for Photographers is: How can I use an EyeFi card with a camera that takes only CF (Compact Flash) cards? All EyeFi cards are the smaller SD (Secure Digital) format, but some cameras—mostly professional bodies—use the larger CF size. SD to CF adapters are available on Amazon and other outlets, but the reviews I’ve seen have always been spotty. Most adapters limit the range that the EyeFi’s Wi-Fi network creates. Now, EyeFi has created its own adapter with a case made entirely of plastic to not blunt the Wi-Fi signal. EyeFi has more information and a list of supported cameras at its site: Eyefi certified CF Type II Adapter for Eyefi Mobi. The adapter costs $20. In The iPad for Photographers, Third Edition, I included a page about TriggerTrap, a neat and useful iOS app that can trigger your DSLR’s shutter in a wide variety of ways (it also requires a separate connecting cable). I also reviewed it for Macworld. Now TriggerTrap has introduced Timelapse Pro, a separate app that adds custom complexity to shooting timelapse videos. …with Triggertrap Timelapse Pro, you don’t just get intervalometer features – there are also our brand new delay modules, enabling the construction of complex timelapse sequences for the first time in a Triggertrap app. The modules are completely customisable: You can add as many as you like, reorder them, and delete them when you’re done! You can also save as many sequences as you like, so you are ready to go in every scenario. 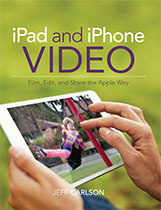 My latest book, iPad and iPhone Video: Film, Edit, and Share the Apple Way is currently Peachpit’s Ebook Deal of the Week! This week only, buy it for 50% off—that’s just $10! 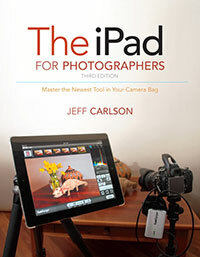 The book was a lot of fun to write, and focuses on how to do everything video-related on the iPad and iPhone. In a very short time, Apple has put a small but capable video studio into iOS. 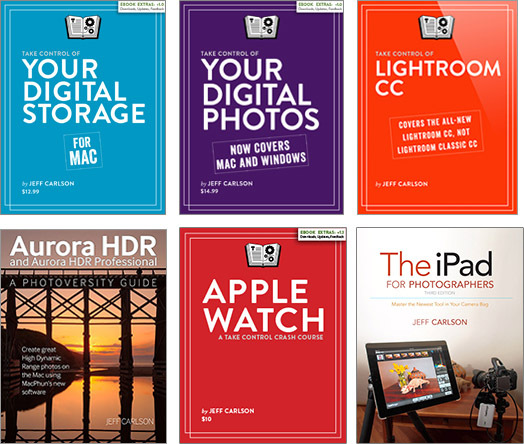 The book covers capturing video using the built-in Camera app and third-party apps such as FiLMiC Pro, correcting footage with tools such as Emulsion (for reducing camera shake) and VideoGrade (for adjusting color), and editing in iMovie. There’s an entire chapter devoted to creating or recording a soundtrack in GarageBand, plus a chapter on making stop-motion animation movies, and then wraps up with all the ways to share video, from uploading to iMovie Theater and shooting-and-sharing Vine and Instagram movies. And, of course, the ebook—like its print counterpart—is filled with lots of full-color illustrations and photos. Jump on this deal now, and enjoy!